Live longer, get smarter? We wish. And this wish could some day come true, thanks to the gene variant KL-VS, whose friendlier name is the klotho gene. The klotho gene was already known to be associated with longer life. But a team of scientists at UCSF and the Gladstone Institutes, found that it also seems to make people smarter. One in five of us has the klotho gene. As this writer is definitely older I had hoped to get in on the smarter, although I never cancelled the dementia provision of my advance directives. But in an interview with San Francisco Chronicle health writer Erin Allday Dr. Lennart Mucke, director of neurological research at Gladstone, said, “Klotho increases cognition but doesn’t replace aging-related decline. You’re just coming down from a higher level.” So much for immediate — or personal — optimism. UCSF Assistant Professor of Neurology Dena Dubal was lead author of the study, findings of which were published recently in the journal Cell Reports. Dubal and Mucke say more studies are needed, but the hope is that eventually klotho could help old brains — old human brains; so far we’re talking about mouse brains — function better. Klotho and her sisters Lakhesis and Atropos where the daughters of Zeus and Themis, and in Greek mythology one couldn’t ask for better parentage. They were known as “The Fates,” or “The Moirai,” the goddesses who determined everyone’s destiny. 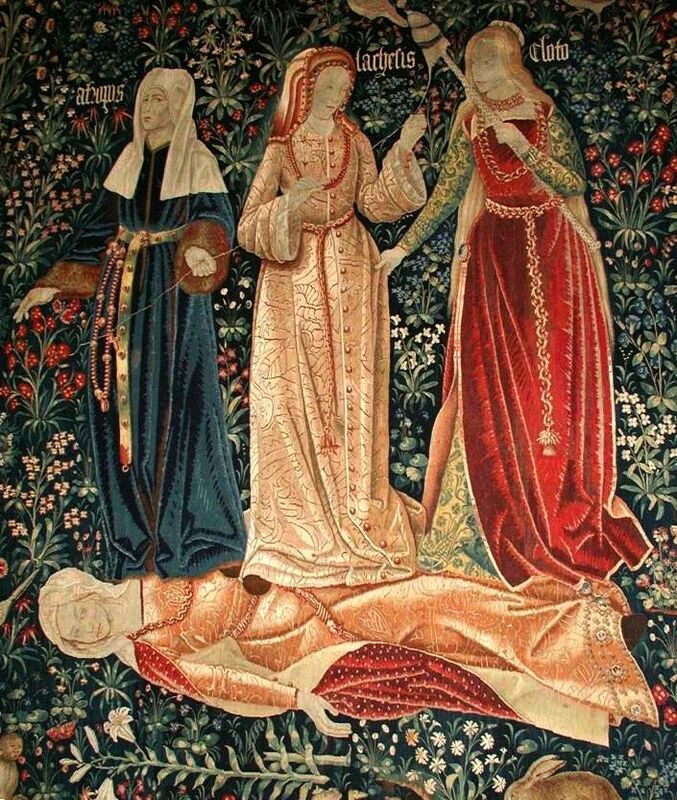 According to Theoi, “They assigned to every person his or her fate or share in the scheme of things.” Clotho (on the right in the tapestry above) was “the Spinner,” who spun the thread of life. Lakhesis (in the center) measured the thread of life and Atropos (on the left) cut the thread. Presumably they are arising from Themis; birthing in mythology was somewhat less complicated than today. No amount of Googling turns up the scientist who named the KL-VS gene variant after Klotho, but he or she had an appropriate understanding of Greek mythology. If Klotho can indeed eventually lead to reactivating old brains, she will have spun us all a golden thread.